Where the "excluded" are "included"
MAGE - Is the Michigan Association of Governmental Employees, a non-profit corporation. Formed in 1980, MAGE represents active and retired State of Michigan Employees who are or were at date of retirement classified as not exclusively represented (NEREs). The purpose of MAGE shall be to provide to the membership professional representation and pertinent information in labor relations, compensation and retirement matters. The Legislature will return next week from their Spring Recess, and the outlook for next year’s budget discussions is as cloudy as ever. Governor Whitmer’s budget proposal hinges on a $.45 per gallon gas tax increase. While there was little immediate reaction from the Republican-controlled Legislature, their messaging has been slowly coalescing into what could be a complete rejection of that proposal. Without those funds, the Governor’s proposal falls apart. Lansing is eagerly awaiting to see what the Legislature’s alternative might be. MAGE will be hosting its Annual Meeting on Saturday, May 4, 2019 beginning at 10:00 AM. The meeting will be held at the Comfort Inn, 2424 South Mission Mt. Pleasant, MI 48858. All MAGE members are welcome to attend at their own expense. If you will be attending the MAGE Annual Meeting, please RSVP by April 5, 2019 to the MAGE office by calling 517-694-3123 or emailing info@mage.org. The first month of a new legislative session is coming to a close, and it has been a whirlwind of meeting new legislators, perusing committee assignments, and re-acquainting ourselves with policy makers in new positions. Moreover, the changeover from the Snyder Administration to the Whitmer Administration is moving along slowly but steadily as her cabinet and key staffers have been announced on a piecemeal basis. One of the last department heads to be named was Robert Gordon, the new DHHS Director. Mr. Gordon previously was a member of the Obama Administration where he served as the acting deputy director at the U.S. Office of Management and Budget and also as the acting assistant secretary for Planning, Evaluation, and Policy Development at the U.S. Department of Education. The Governor presented her State of the State address on February 12 in which she made several positive remarks about state workers and their value to Michigan. Her budget presentation will take place in early March, and it will be there where she lays out more detailed specifics about her policy goals. Enclosed in this article are links to the OPEIU Scholarship applications, rules and regulations. Please remember to complete the application fully, then send to the MAGE office so we can verify for OPEIU that your membership is in good standing. Read on for the link to the applications. MAGE Office Hours are 8:00 a.m. to 5:00 p.m. weekdays. MAGE Address: 6920 S. Cedar, Suite 7, Lansing MI 48911. Would you and your co-workers like to meet with MAGE representatives and hear what MAGE has to offer? We'll come in, buy lunch and discuss what MAGE can do for you. Just call the MAGE office at 1-800-477-6243 and we'll be happy to set this up for you. Click on the heading above to view the latest OPEIU - White Collar Publication. MAGE- OPEIU Local 2002 members are represented by our professional labor relations staff, our legislative lobbyists, Capitol Services, and in Board approved litigation by Brandon Zuk, of the Fraser, Trebilcock firm. Members are afforded the opportunity to serve on the Board and MAGE Committees, and become directly involved with the day to day activities of MAGE. Nation Safe Drivers $200 per year benefit - provides 2 tows or service calls up to $100 each per year. Please note the year begins at the time of your first call. To receive a tow or service call NSD at 1-800-617-2677 Producer Code: 74046 Plan Code C - you are a member of MAGE OPEIU Local 2002 and your MAGE number is your State of MI Employee ID number. OPEIU Union Scholarships - Howard Coughlin Scholarship worth over $6,000 plus John Kelly and Romeo Corbeil scholarships. MAGE Scholarships and Student Debt Reduction Awards at $1,000 each (usually 3 or more awarded each year). Winners are randomly selected from all applicants. Click here for the application and instructions. OPEIU FREE COLLEGE Benefit. Click here for the flyer. Enhanced Retiree Benefits include: $2,000 Accidental Death and Dismemberment Policy, Towing/service Benefit for 2 calls per year up to $100 each, Identity Theft Protection, Free College Benefit, HotelStorm discounts, Union Plus Discounts and Membership in the WellCard Health Program. Following discussions between the unions representing NEREs and the Office of the State Employer, the Civil Service Commission on December 12, 2018 approved the following which will be implemented as of October 1, 2019. MAGE dues will increase by the same percentage of the general wage increase each year. The Commission approved a 2 percent base pay increase plus a one-time lump sum payment equal to 2 percent of your salaries effective October 1, 2019. 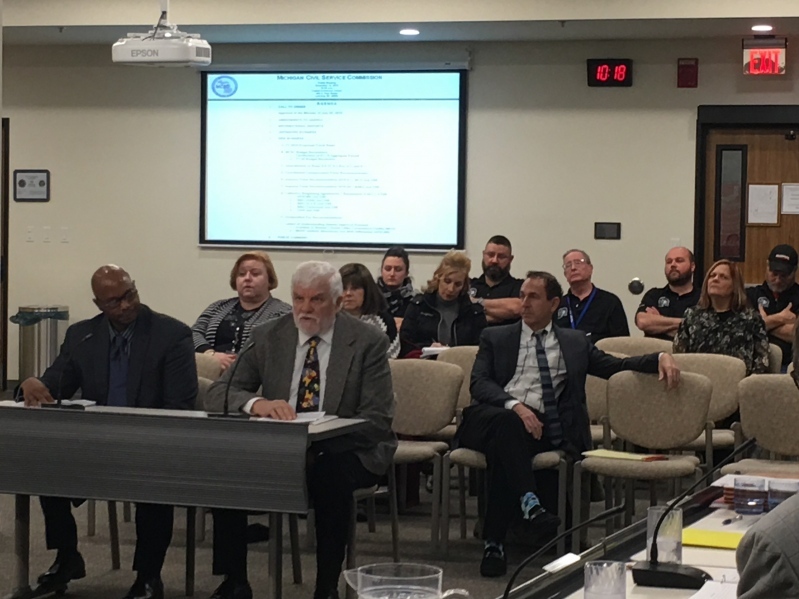 MAGE also advocated for a special wage increase for the Program Manager 14's who work in the Department of Health and Human Services (DHHS), specifically the Child Protective Services (CPS) Supervisors who have not been compensated for being on-call. We succeeded in obtaining a decision from the CCP panel which recommends that the department seek some avenues for ameliorating these disparities. MAGE is currently in discussions with the department to remedy this inequity. Stay tuned to your MAGE webpage for progress. MAGE advocated for our embattled RN Managers and Supervisors. We succeeded last year in securing a $5,000 retention bonus and a $5,000 recruitment bonus for our RN's in our state hospitals. This year we attempted again to secure these same bonuses for our RN's residing in the Department of Corrections (DOC) and Department of Military and Veterans Affairs (DMVA). We did not succeed, however, the panel did recommend extending the $5,000 recruitment bonus in the DHHS. Click here to see MAGE's Coordinated Compensation Proposal for FY 19/20. President Quattrin and Vice President Brant Wimbush present at the Civil Service Commission meeting. 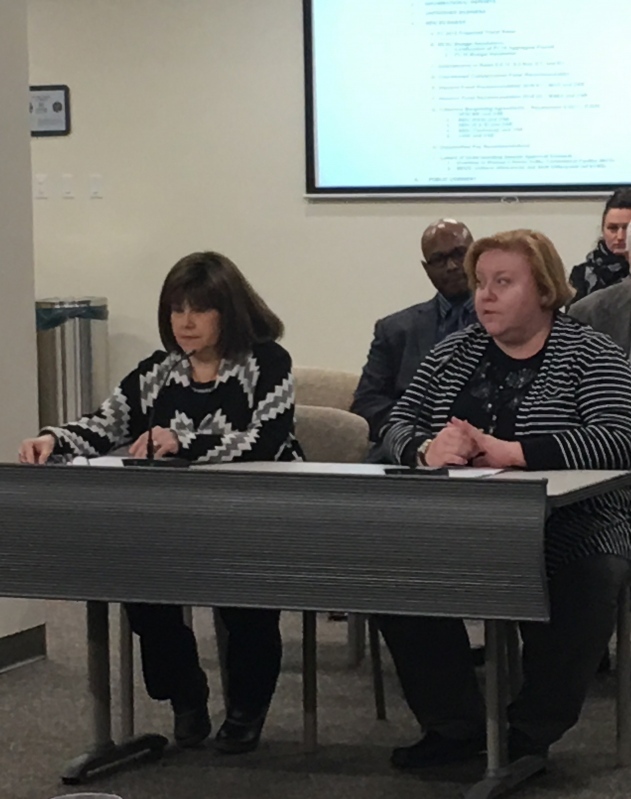 Andrea Vandenbergh, Director of Nursing at Hawthorn Center and Kay Young RN Manager from Jacobetti Veterans Facility advocate for RN's at the Civil Service Commission meeting.